Davies is one of only a few centres in the UK to offer CUE surgery to treat the severe form of medial compartment disease in dogs. Davies Veterinary Specialists has invested in the latest cutting edge surgical equipment to treat severe canine elbow dysplasia. The procedure, Canine Unicompartmental Elbow (CUE), offers a promising alternative for dogs diagnosed with the condition and we are one of only a few centres in the UK to provide this surgical option. Elbow dysplasia (ED) is the most common cause of chronic front leg lameness in dogs. There are many forms of ED but the shared feature is that all affected dogs have osteoarthritis. Elbow dysplasia is a very complicated condition and the precise causes and mechanisms related to its development are not completely understood. The problem is primarily genetic and is probably not caused by lifestyle (e.g. excessive exercise as a puppy). Large breed dogs are affected more commonly than small breed dogs. Cartilage pathology is caused by a poor fit of the elbow joint. The elbow is made up of three bones (the humerus, radius and ulna). Poor fit means that there is excessive pressure in one region and this causes cartilage/bone fragmentation, severe cartilage wear or both. What are the different types of elbow dysplasia? Although there is a spectrum of ED severity, it can be divided into a focal (mild) form or a diffuse (severe) form. In the focal form, most of the cartilage surfaces are either normal or nearly normal. One corner of the elbow has focal arthritis (usually fragmented cartilage and bone). This problem has been compared to having a stone in a shoe. In severe diffuse elbow dysplasia, there is diffuse cartilage wear which often results in bone rubbing against bone. This severe form of osteoarthritis is called medial compartment disease. Image shows severe diffuse elbow dysplasia. Importantly, there is no cure for elbow dysplasia. There are a multitude of treatment options that can help (but not cure) elbow dysplasia. For each option we consider the potential benefits, harms and uncertainties. 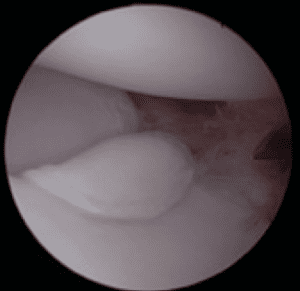 For focal elbow dysplasia, the commonest treatment is arthroscopy. The broken cartilage and bone is removed via keyhole surgery. Most dogs make significant long-term improvements after elbow arthroscopy. In dogs with medial compartment disease, the prognosis is much worse than it is for focal elbow dysplasia. Once again, we decide on the most appropriate treatment based on its potential benefits, harms and uncertainties. Canine unicompartmental elbow replacement (CUE) is a treatment option for dogs with the most severe form of medial compartment disease. 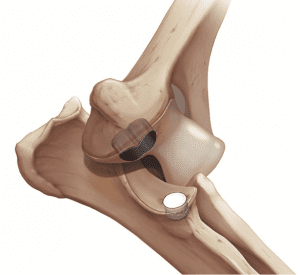 This surgery involves partial resurfacing of the elbow joint. We consider CUE a significantly better option than total elbow replacement because it has better and faster rates of improvement and a significantly lower risk. About 80% of dogs operated by CUE will experience a long-term improvement in lameness, exercise tolerance and comfort. Dogs use their operated limb quite well (albeit with an obvious lameness) within the first week after surgery. This procedure can be coupled with a bespoke programme of oral medication and physical therapy to maximise long-term improvement. This is a major operation. The surgical approach is extensive and CUE requires that the elbow is opened up completely in order to properly place the implants. Aftercare is very strict. Operated dogs typically stay with us for 2 nights after surgery. They return home with a bandage in place for 2 weeks and require very strict restriction for at least 6 weeks. Major complications occur in approximately 10% of operated dogs even when surgery is performed by a specialist. If a major complication occurs, this can have a significant negative impact on quality of life. Affected dogs can end up worse than they were before surgery. In some cases, there may be a requirement for salvage surgery (elbow fusion or amputation). In such unfortunate cases, associated costs can be very high. On average, it takes 6 months to reach peak function after CUE surgery. The rate and magnitude of improvement varies between individuals. In dogs with severe arthritis affecting both elbows, the worst affected elbow is treated and we wait and see what happens with the other elbow. If this were to cause more problems later in life, CUE of the second elbow can be considered. Cost of CUE is fixed at £5,000 including VAT for new cases and £4,000 including VAT for registered cases that have been waiting for CUE to become available at Davies Veterinary Specialists. Reassessment is required after 6 weeks including sedation and x-rays. This costs £485 including VAT.